Definition at line 67 of file pool.h. Definition at line 69 of file pool.h. 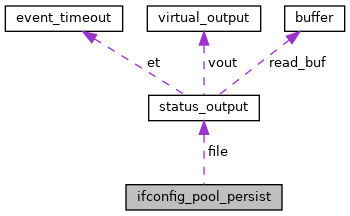 Referenced by ifconfig_pool_persist_close(), ifconfig_pool_persist_init(), ifconfig_pool_read(), ifconfig_pool_write(), and ifconfig_pool_write_trigger(). Definition at line 70 of file pool.h. Referenced by ifconfig_pool_persist_init(), and ifconfig_pool_read().